CarGurus has 26,333 nationwide F-350 Super Duty listings starting at $2,800. Need a one-ton full-size heavy-duty pickup to rule the building supply parking lot? 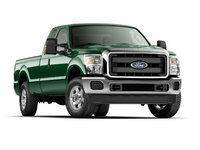 Check out the 2014 Ford F-350 Super Duty lineup. Not only will it handle all your towing and hauling needs, but it looks good doing it, and it’ll pamper friends and family out on the road. This is a big vehicle meant for big jobs and constitutes what many reviewers call the best value in a workaholic super-sized pickup. Little has changed in this year’s F-350 Super Duty lineup, with the exception of some minor tweaks to option packages. Again available in 5 trim levels, the base XL, the up-featured XLT, the almost-luxurious Lariat, the loaded King Ranch and the top-shelf Platinum, this big Ford is again offered with 3 cab configurations and 2 bed lengths. The 3-passenger Regular Cab is available to the XL and XLT trim levels and sports only the 8-foot, 2-inch long bed. XL, XLT and Lariat editions can be delivered with the 6-passenger, 4-door SuperCab and sport either the long bed or the 6-foot, 9-inch standard bed. The 6-seat Crew Cab, finally, flaunts 4 independently opening doors and is available to all trim levels in both bed lengths. All trims, except those toting the standard bed configuration, are eligible for a dual-rear-wheel axle that comes with a 3.73 rear axle ratio for some hefty towing and hauling capabilities. Of course, this brutish beast of burden likely will also come with standard rear-wheel drive (RWD), while bushwhacking part-time 4-wheel-drive (4WD) capability is available throughout the lineup, and features auto-locking hubs and manual or electronic hi-lo gear selection, depending on trim level. Again, standard power for all F-350 Super Duty trim levels is a gasoline-burning 6.2-liter Flex Fuel V8. Mated with the 6-speed shiftable automatic transmission, this hefty powerplant will churn out 385 hp and 405 lb-ft of torque. Standard payload capacity with the single-rear-wheel axle is 6,520 pounds, while the dual rear-wheel trims can haul over 7,000 pounds. Towing, meantime, is maxed out at over 14,000 pounds with the proper equipment. Mileage figures are once again unavailable but despite variable valve timing (VVT), they won’t be pretty. For those needing significantly more towing muscle, a 6.7-liter V8 turbodiesel powerplant again mates with the 6-speed shiftable automatic for 400 hp and 800 lb-ft of torque. Towing is maxed out at some 18,000 pounds with a dual-rear-wheel, diesel-powered trim with the standard hitch and wiring setup and the available heavy-duty tow package, while an available fifth-wheel or gooseneck towing package ups the total to 22,600 pounds of trailer-toting capacity. Expect the base 2014 F-350 Super Duty XL Regular Cab to once again boast 17-inch painted steel wheels and vinyl upholstery, along with telescoping tilt-wheel steering, air conditioning and an AM/FM stereo with 2 speakers. SuperCab and Crew Cab variations, obviously, add split-folding rear seats as well as floor mats in front and rear. The XLT trim level, meanwhile, throws in 17-inch alloy wheels, cloth upholstery, full power accessories, including heated power-adjustable exterior rear-view mirrors, Ford SYNC hands-free infotainment via Bluetooth technology, cruise control and a single-CD player with 4 speakers and a USB port. Gaining a little luxury, the Lariat trim level sports standard 18-inch alloy wheels, a power sliding rear window, premium leather upholstery, power-adjustable front seats, power-adjustable pedals, rear parking sensors, a rear-view camera, dual-zone climate control and an auto-dimming rear-view mirror. Leather and simulated wood accents grace the well-wrought cabin, while a 9-speaker audio system flaunts a video monitor, satellite radio and a memory card slot. The 2014 F-350 Super Duty King Ranch takes luxury even more seriously by adding step running boards, heated and ventilated front seats, memory for driver's settings, 9 Sony premium speakers, remote engine start and memory-card-based navigation, with the flagship Platinum throwing in 20-inch alloy wheels (single-rear-wheel trims only), a heated steering wheel and unique exterior and interior molding and trim upgrades. As for options, lower trim levels should remain eligible for many of the items that come standard with the higher trim levels. Meantime, the XL and XLT can be delivered with Ford’s touted Work Solutions Package, featuring an in-dash computer, and higher trims can be equipped with the FX4 package, boasting an electronic locking rear differential, all-terrain tires, descent control, skid plates and burly Rancho shock absorbers. Such available items as a power sunroof, transmission takeoff power (i.e. for snowplow equipment, air compressors, etc. ), heavy-duty alternators, a spray-in bedliner and SYNC-interfaced MyFord Touch can also be added as standalone options, depending on the trim level. Finally, standard safety features in the 2014 F-350 Super Duty are expected to remain 4-wheel antilock brakes (ABS), traction and stability control, front side-mounted airbags and front (and, in SuperCab and Crew Cab trims, rear) head airbags. Additionally, look for a post-collision safety system and back-up chime to remain standard in all trims, while the EXT and higher trims add standard SYNC emergency assistance communications and a remote antitheft alarm. The Lariat and higher trim levels, meanwhile, should once more flaunt standard turn-signal-integrated mirrors, front fog/driving lights and dusk-sensing headlights. 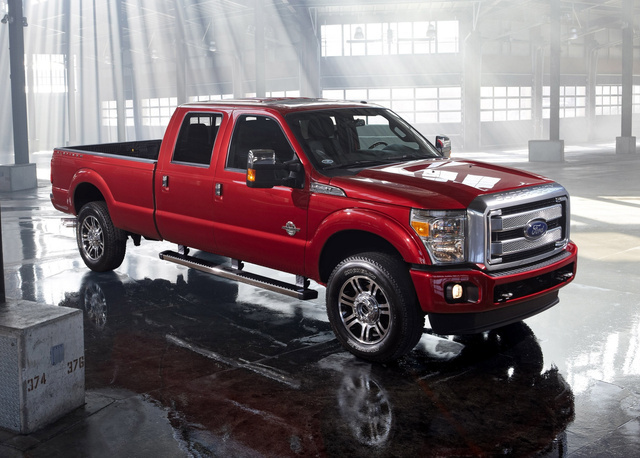 What's your take on the 2014 Ford F-350 Super Duty? Cumminsforever12 Brand new 2014 Lariat is what I bought. Thought I would change it up from Cummins and Ram (why I did this I have no idea), because we had a Ford Flex that was awesome. Well, the reason I never bought a Ford truck hit me in the gut at only 300 miles. This was a brand new truck. Under the first load, the truck sagged six inches. Really Ford? My Rams had heavier loads than this and never moved an inch. Well within a few short minutes of the 300 miles, the check engine light, low power and misfiring. Apparently after reading the OBD codes, and cross-referencing them through Google. Yep the 6.7 is plagued with this issue, and yes, you will be out of your 64k truck for weeks while they muddle through the TSB reports and try and figure it out. Ford pretty on the face, but it's no work horse, nor does their 6.7 have a good reputation. I can't wait to go back to Ram, 2015 they have the 25 year anniversary with Cummins. That motor was bulletproof and a workhorse. Ford is pretty, very pretty, but when it comes to what's in side, beware!!!!!!!!!!!! Users ranked 2014 Ford F-350 Super Duty against other cars which they drove/owned. Each ranking was based on 9 categories. Here is the summary of top rankings. 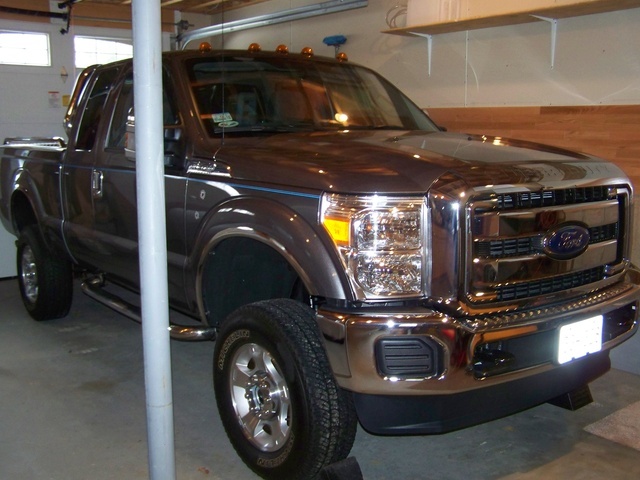 Have you driven a 2014 Ford F-350 Super Duty? F350 2014 Ford tail lights not working...what is the fuse number for the tail lights? Replaced Both Batteries In 2014 F350 Diesel. Now have a wrench symbol. Manual indicates powertrain malfunction/ reduced power/ electronic throttle control. Contact dealer as soon as possible. Anyone with any idea of what the problem is? My Truck Is In BC Canada Can I List It Here On Your Site? With my truck here in Prince George, BC, Canada can I list it on your site. I tried but it will not take my zip/area code.